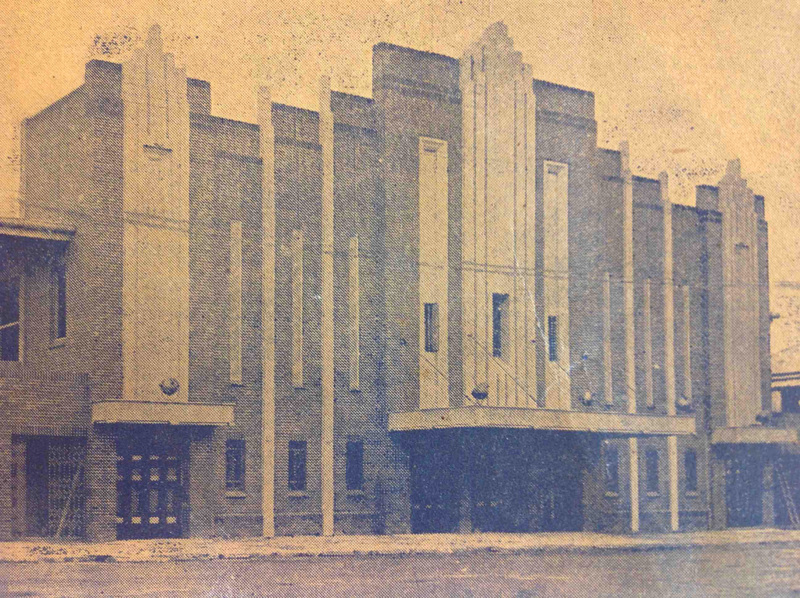 Along with dances, cinemas were the social and cultural heart of Queensland regional towns in the Art Deco era and people would travel long distances to be part of the spectacle. Birch Carroll and Coyle, a pioneering consortium of film exhibitors, was attuned to this demand for high quality cinema experiences outside the capital city and over several decades established a popular network of regional theatres in centres including Ipswich, Toowoomba, Maryborough, Bundaberg, Rockhampton, Mt Morgan, Townsville and Charters Towers. While many of these cinemas were purpose-built for Birch Carroll and Coyle in the 1920s as part of the lavish Wintergarden chain, the consortium also managed competition in each town by integrating more modest, existing theatres into its portfolio, such as Earl’s Court in Rockhampton. Earl’s Court was of special significance to George H. (“Geo”) Birch, one of the founders of the original Birch Carroll partnership in 1911, to which Virgil Coyle later added his network of North Queensland cinemas in 1923. Geo was born in England but lived his last 30 years in Rockhampton as a prominent business owner of hotels and theatres. He was lauded for his generosity and remembered fondly for his immaculate white suits and straw hat. In 1910, a year before going into partnership with the Carroll brothers, Geo purchased the Goodsons’ Promenade Concert Ground on the corner of Denham and Alma Streets and established the Earl’s Court open-air cinema in its place. These were the days of silent movies, with a stage built at the back of the 1500-seat theatre for Foresters’ Brass Band to play its musical accompaniments. Geo died unexpectedly in 1917, leaving his wife Mary, who was also a partner in the Birch Carroll company, to realise his ambition for the building of a modern theatre on the Earl’s Court site. This happened incrementally, and in many ways, the history of Earl’s Court is the history of cinema architecture in Queensland between the turn of the century and the beginning of World War Two: after starting life as an open-air enclosure, it was converted into a large barn-like shed with the addition of a hard top roof, and finally, in 1939, completely rebuilt in the Art Deco style. The new Earl’s Court embodied the Tropical Theatre concept for which Birch Carroll and Coyle was famed. To ensure the venue was suited to Rockhampton’s sub-tropical climate, roller blinds and shutters were installed so that the walls of the theatre could be opened in warm weather and closed in the cold and rain. Bougainvillea planted along the Alma Street side of the cinema, and a palm court designed by the curator of the Botanic Gardens, added to the tropical setting. The showcasing of local flora was a strategy used by Birch Carroll and Coyle to counter the “Americanisation” of Australian cinema culture. Earl’s Court was among the biggest one-floor cinemas in Australia, seating 2500 people. The theatre’s wooden floor gradually sloped upwards, with the back seats raised four feet above ground level. While ticket prices varied – centre stalls being most expensive, followed by back stalls and front stalls – Birch Carroll and Coyle marketed the egalitarianism of its seating arrangements, with all patrons offered the same sponge rubber tip-up chairs. The cinema interior was decorated in pastel shades of pink, turquoise and cream popular in the Art Deco era, with accents of gold. This colour scheme carried through to the light fittings, which were integrated into the lattice and fibreboard ceiling. The cinema was equipped with the latest sound technology from Birch Carroll and Coyle’s preferred supplier, Western Electric. Although modified substantially, the site of the Earl’s Court Theatre continued to be used as a cinema complex until 2000. The building remains standing today – occupied by St Andrew’s Presbyterian Church – however its Art Deco features are a shadow of their past. The structural bones of the facade are discernable, but its decorative vertical fins have been excised, its brickwork plastered over and much of the exterior concealed by corrugated awnings. By contrast, the restored (former) Swan Hotel stands two doors up, its turquoise piers and horizontal accents a celebration of its interwar heritage, and a reminder that this part of Denham Street was once a thriving Art Deco precinct. 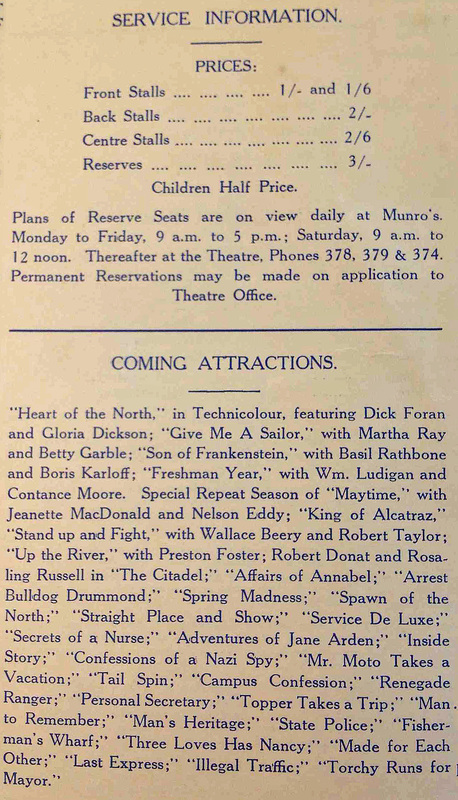 Earl’s Court Theatre newspaper advertisement, Morning Bulletin (Rockhampton), 6 August 1940. Brass band graphic, Morning Bulletin (Rockhampton), 19 April 1930. Earl’s Court Theatre facade, 1939, via Bonzle. Cover of Opening Programme: Official Opening of Earl’s Court, 1939. Photograph by Queensland Deco Project. Physical item held by John Oxley Library, State Library of Queensland. 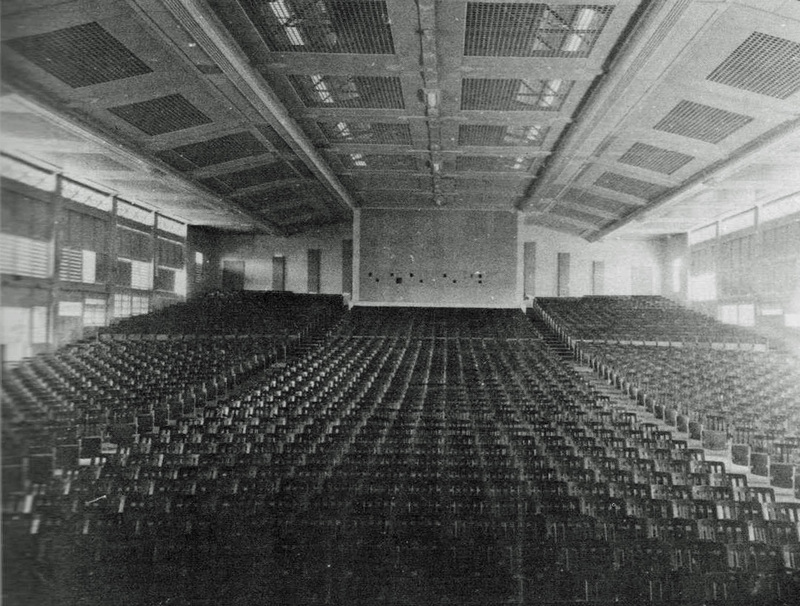 Earl’s Court Theatre interior, 1939, via Bonzle. Service information, Opening Programme: Official Opening of Earl’s Court, 1939. Photograph by Queensland Deco Project. Physical item held by John Oxley Library, State Library of Queensland. 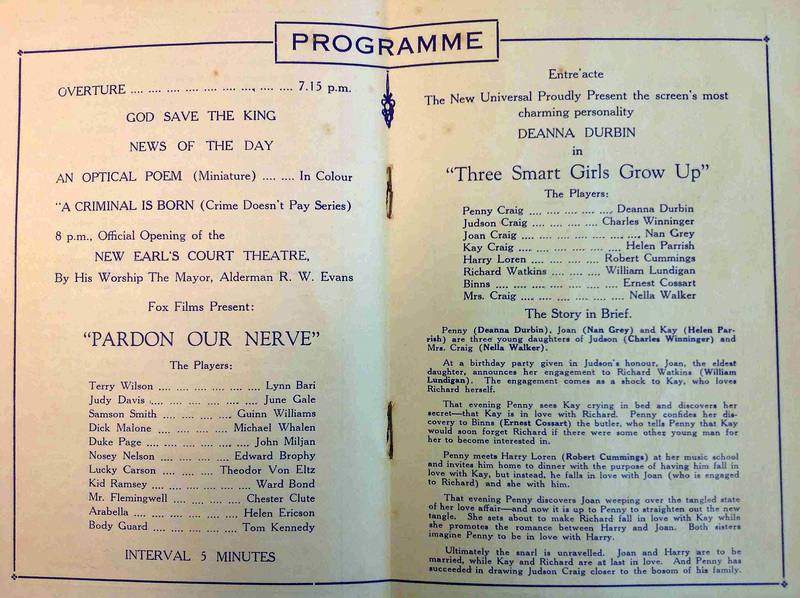 Opening night program guide, Opening Programme: Official Opening of Earl’s Court, 1939. Photograph by Queensland Deco Project. Physical item held by John Oxley Library, State Library of Queensland. Cryle, Denis, Betty Cosgrove and Ray Boyle. “Birch Carroll and Coyle and the Regional Picture Palace: A Case Study.” Transformations, no. 1, 2000. Cryle, Denis and Grace Johansen. “Maintaining a Tradition of Mixed Entertainments: Birch, Carroll and Coyle’s Regional Queensland Wintergarden Theatres.” Screening the Past, 2006. “Earl’s Court Theatre: Official Opening of New Building.” Morning Bulletin (Rockhampton). 20 July 1939, p.10. “New Earl’s Court Near Completion.” The Evening News (Rockhampton). 5 July 1939, p.3. “New Earl’s Court Special Opening Feature.” The Evening News (Rockhampton). 18 July 1939, p.9. “New Earl’s Court Theatre to be Opened on July 19: Claimed to be the Largest and Best Equipped in Australia.” Morning Bulletin (Rockhampton). 5 July 1939, p.11. 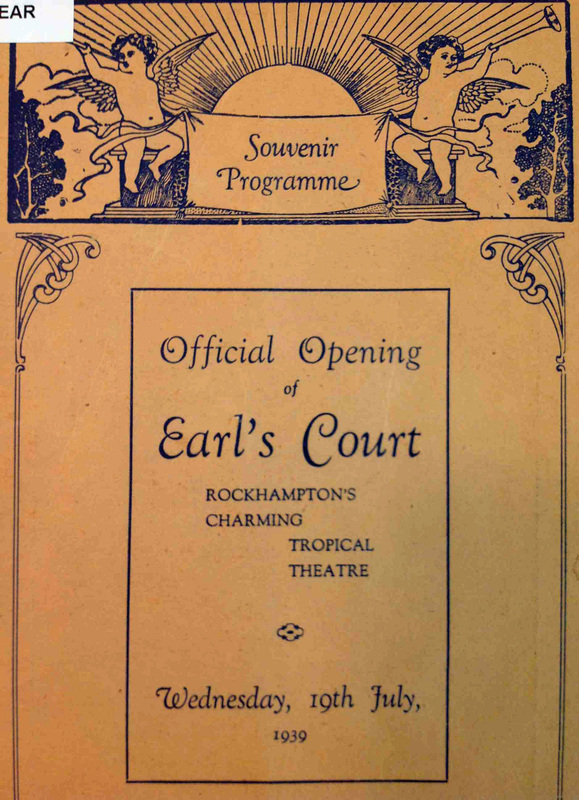 Souvenir Programme: Official Opening of Earl’s Court: Rockhampton’s Charming Tropical Theatre, Wednesday, 19th July, 1939. Record Printing Co. Pty Ltd, 1939. “The New Earl’s Court: Who Built and Equipped the Theatre.” Morning Bulletin (Rockhampton), 19 July 1939, p. 7.